Home > mutual-fund > How To Start SIP? Congratulations on finally deciding to step into the investment world of mutual funds. It is convenient and easy, coupled with the inflation-beating returns from equity funds. This is a productive way to multiply surplus income and savings to achieve your financial goals. 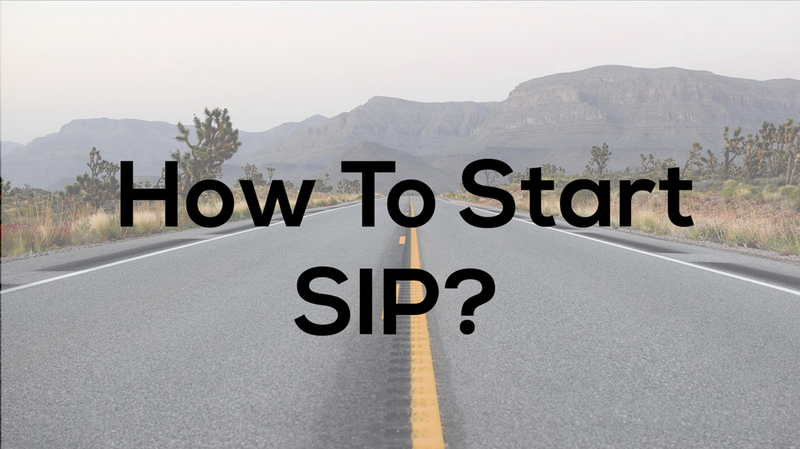 As a newbie, you may be wondering about how to invest in SIP and in this chapter we have covered that for you. Broadly, there are two ways to start with SIP: offline and online. But before you embark on the journey of investing in mutual funds, you need to complete your KYC (Know Your Customer) formalities. KYC is a prerequisite for investing in mutual fund SIPs (and almost all financial instruments). It is vital compliance on the part of financial product manufacturers, to know their investor better. First step is to understand your needs and then define your goals such as buy a house, child's education, retirement and so on. Accordingly, you should define the time horizon to achieve these goals. For instance, you want to buy a house in 3 years. Giving time-line to your goals will make it more definite. Depending upon you income, debt obligation, number of dependants and other factors you need to understand your risk appetite. As you know there are two modes to SIP in mutual funds - online or offline. This is a crucial step select the right mutual fund to SIP. Depending on the true nature of funds you must select the right SIP to meet your investment goals. Equity Funds are High Risk - High Return proposition but they are crucial to build wealth over log run. Balanced Funds are Moderate to High Risk and Moderate Return by nature. A fair allocation to these funds would be prudent to balance out the risk return parameters. Debt Funds are Low Risk-Low Return in nature but are not risk free. SIP in debt mutual funds aids in creating a balanced portfolio along with equity and balanced funds. Hence choose a fund to SIP prudently. We at PersonalFN believe in creating a balanced portfolio. One size does not fit all. We strongly recommend you to consult a financial planner and build your customised asset allocation. Depending on your personal priorities you can set your SIP frequency, date and amount. Different SIP Frequencies are daily, monthly, quarterly or half-yearly. SIP Dates vary from one fund to another. For example, 5th or 15th of every month/quarter. You can choose the SIP Amount which can be as low as Rs 500 a month. Once you have decided on the above details you need to fill up the SIP or Common Application Form and submit it to your respective intermediary if you choose the offline mode. In case of online mode, you are just a few clicks away. Let's look at both offline and online mode of investing in detail. To start SIP offline is a conventional mode of investing. You can buy and sell mutual funds units online, just like you buy a dress online. You could buy SIP online by investing in mutual fund schemes directly through the online portal of the Asset Management Company. For instance, if you wish to invest in Fund A, you can go its fund house website and buy fund units online. However, if you have multiple SIPs, then you need to register and invest in each fund house individually. Of course, this is an inconvenience if you choose to have a number of schemes from different fund houses. So, choose your investments with due diligence. The registrars also facilitate SIP investment online, however, the investment will be limited to the mutual funds registered with them. Portals like MFU provide single window to transact across the major mutual fund schemes through its online portal. MFU (Mutual Fund Utilities) is a single window for you to transact across mutual fund schemes using a Common Transaction Form (CTF) or through the online portal. All you have to do is first create your Common Account Number (CAN), which is a unique reference number issued by MFU. If you are an existing mutual fund investor, the CAN will map all existing mutual fund folios across fund houses (participating in MFU), thereby providing a consolidated view. Robo-advisers are digital advisers that provide portfolio management and financial planning services online, without any human intervention. These types of advisers are usually more affordable than human advisers to all classes (of investors). The advantage with robo-advisers is zero human bias in the advice. A robo-adviser can offer you a world of convenience, thanks to the advancement in technology. Opt for a specialised robo-advisory service that will ensure your financial well-being through mutual funds—one that proves to be worth more than it costs. Select one who are genuinely concerned about your long-term financial well-being. Be careful of not investing your hard-earned money through fly-by-night operators. Prefer robo-advisers backed by established companies in the financial services space. Check if sound and ethical research processes fully support their investment recommendations. They should be fee-based to ensure that the commissions they earn do not influence their advice. If you are tech savvy and abhor keeping paper records, then you may appreciate the robo-advisors even more. There are different modes to start a SIP. Start a SIP online to avoid dependency and make an informed decision. As the world is moving into the online space with its ease and conveniences, it is quite likely that the online services will replace the human intervention. Nevertheless, some amount of convergence may also be seen if there's intent to serve investors better. Investing online may be appropriate for those investors who are tech savvy. Those who prefer going "the green way", abhor keeping records in the paper form, and prefer to keep almost everything in electronic form may appreciate the robo-advisories even more.